Taste of Baltimore: One Lovely Blog Award - Thank You!!!! 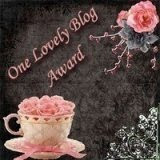 My wonderful friend over at Simply Life, awarded me the "One Lovely Blog Award" - how Lovely, indeed! Before I gush with pride about being awarded something for my little Bloggy, let me first say that you should definitely check out Simply Life for her AWESOME recipes. I've saved many of them to make later, including the pesto recipe she recently blogged about :) Thanks again - you are SUPER! OK, now time to gush - yayayayayayayayayayayaayay! OK, done. 1. Ikea Hacker - SOO many tips for Ikea furniture and accessories. 2. An Indian's Makeup Blog - I LOVE her tips, enthusiasm, and makeup! 4. Every Last Cookie - She is attempting to (and will succeed!) bake and blog about each cookie from Martha Stewart's Cookie Book before she graduates from college. She is also hilarious! 5. Culinary Concoctions by Peabody - Not only are her recipes/pictures delicious, but I look forward to reading her intros every time she blogs. She is insightful, witty and smart. 6. Copy Cat Chic - For someone who is constantly looking for a good deal on furniture or other home products, this is the blog for you! 8. My Milk Toof - HILARIOUS adventures of two teeth named ickle and Lardee. Need I say more? 9. Smitten Kitchen - Amazing recipes, amazing photography. Too fun! :) thanks for the kind words! Oh, you should definitely make the pesto and go to the recipe link I posted for measurements with fresh basil :) Hope things are going great! Well thank you so much! Love your blog as well! Thank you so much for thinking of my blog Nakiya! I really appreciate the award!